If 2017 was dominated by #fakenews, then 2018 will be the year of #FakeTrends. These are ideas that don’t bear extended scrutiny, but sound just plausible enough to fool a trigger-happy marketer into handing over some cash. Ever eager to learn what these #FakeTrends might be, we focus-grouped a demographically balanced sample of marketers from GenZ, iGen, Centennial, Post-millennial and the Homeland generation to discover how we can snag the attention of jaded consumers with the latest shiny thing. And that’s, essentially, what a #FakeTrend is. Something shiny and innovative-sounding that will grace ‘Top 10 marketing trends for 2018’ lists everywhere. Take these lists – these trends – with a pinch of salt. Anyone hoping to uncover a secret marketing super-weapon that cuts through the noise and delivers brand messages into the hearts and minds of consumers like a laser-guided love bomb will be disappointed. But still, the lists will come. So, we put on our thinking hats and came up with some #FakeTrends of our own. Look how well Pepsi managed to align itself with the spirit of youthful rebellion through its uplifting Kendall Jenner ad, setting the world to rights with just a single can of cola. And Dove! Look how it covered itself in glory after its ham-fisted attempts at inclusive messaging whipped up a racism row. Other brands take note: this is the future. Piling in on touchy and divisive issues is the perfect thing for mass-market brands to be doing (probably not). Unless, of course, there’s a genuine alignment with your brand. The ASA are introducing new rules on gender representation. We can only hope this means an end to ads depicting hapless dads being universally crap while harassed mums clean everything up and sweep picture-perfect boys and girls off into perfectly groomed suburban bedrooms. And no-one is going to get outraged about this, especially not on Twitter. We certainly won’t see a stream of rage-filled tweets assembled from the words ‘PC gone mad’, ‘luvvies’, ‘snowflakes’ and ‘feminazis’. Conversion-focused activation campaigns usually show a return, so the budget-shift away from brand-building to activation makes perfect sense. This is because people are entirely rational, always know what they want and are never open to persuasion. And even if that wasn’t true, simple Google PPC ads offer more than enough space in which to be charmingly persuasive. 100 characters is ample. John Lewis must be crazy, investing all those millions in Christmas stories. To be honest, we’re surprised they’re still in business. As long as you are targeting an audience of inattentive robots, you’ll do just fine. But somewhere between 40% and 90% of those ads may never be viewed by, well, actual humans. 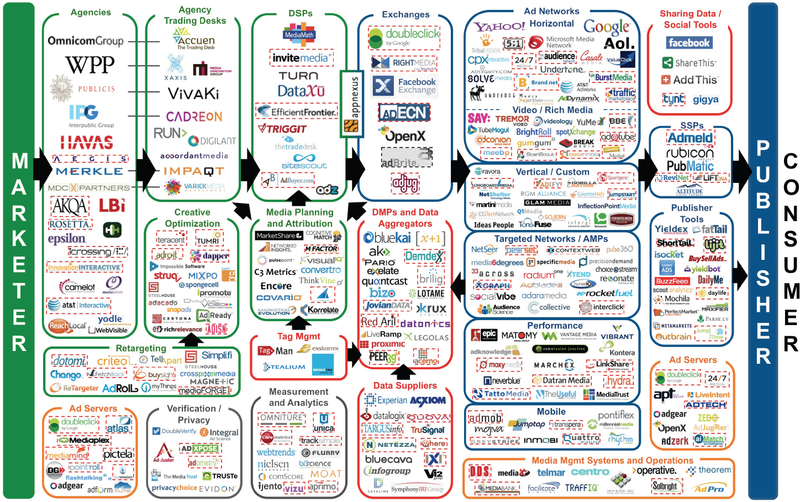 There’s an old Warren Buffett tip that applies here: “Never invest in a business you cannot understand.” Looking at the tangled mess that is the programmatic ad buying market, you’ll have little chance of figuring out where your ads will end up, or who will see them. And the only metrics you have are supplied by the people who sold you the ads. Unsurprisingly, fraud is rife and trust is low. But all this is going to be cleaned up in 2018. We’re 100% sure of that. Right? Here’s a fun game: create posts on a few social platforms, use bit.ly links to point back to your (Google Analytics tracked) website, then watch in awe as each platform reports completely different numbers for referrals and conversion. Add in a couple of sentiment monitors and various engagement metrics and you now have a smorgasbord of different numbers to choose from. Pick a number, any number! It’s hard enough reconciling the different numbers reported by different parts of the Google empire, let alone between platforms. And we only have their word for it. Despite repeated admissions that they get the numbers wrong, Facebook and Google are still basically saying ‘trust us’. But, when firms who can see both publishing and brand ends of the system, can’t make the numbers add up, what chance do the rest of us have? So, you don’t know where your ads are going and aren’t sure about conversion rates. But you can be 100% certain your ads won’t appear next to inappropriate content. What part of this paragraph seems sane to you? After years of being showered with marketer-love, millennials are telling us that they are gorged to the gills with our flattery and attention. Marketing to this demographic is a solved problem, anyway. Meanwhile, enviously looking on from the cheap seats are GenZ. We’ve been neglecting them. In 2018, we’ll put that right. But be warned, this lot are even more fickle, flighty and full-on than millennials are accused of being. Even so, they are just itching to understand their own, unique, generational stereotype, expressed through the medium of contemporary comms. It’s funny: none of the engineers working in AI call it that. They call it “Machine Learning” (ML). Given a good algorithm and enough data, computers can now learn languages and recognise faces. Incredible stuff, but not intelligence. AI can’t define problems. What it does well is to optimise relentlessly once the problem has been defined. A computer can beat you at chess if you teach it the rules. It can’t invent chess. Only humans can do that. And machines don’t understand emotion, humour or originality, so AI won’t create your next campaign concept. Not without people. Virtual Reality (VR) will fail this time around for the same reason it failed last time around: strapping a rubberised brick to your face makes you look like a twonk. And it blinds you, so you thrash about foolishly before tripping over the wires and crash headlong to the floor. Augmented reality is going to be huge though. It’s fun, here now, available on every smartphone and even intermittently useful. Yes, 2018 is going to be amazing, a bumper year for shiny things. More importantly, people will stop clinging stubbornly to their old ways. Instead, we will march together into a bold new advertising utopia! Ads will no longer be skipped, spontaneous recall will skyrocket and even simple PPC response ads will trigger deep, lasting, lifestyle changes in all our target audiences. But only if we abandon old-fashioned ideas like delivering the right message to the right person at the right time. That stuff never works. What should we actually focus on in 2018? Uncovering people’s emotional needs and showing how your brand fulfils them is still the heart of great advertising. So be bold: commission original, creative and compelling ads that spring from real human insights. Target them with care so they reach people genuinely interested in your message. And finally, measure the effects as best you can, reacting quickly when things go right, or wrong. None of this is new and every part of this process is human, messy and imperfect. And a wellspring of creativity for that very reason. Used intelligently, innovative technology and even just ‘shiny-new-things’ can be incredibly powerful ways to snag consumers’ attention. We just need to be mindful not to jump on the bandwagon just because it’s exciting and new. Or, worse yet, because someone somewhere says, “everyone will be doing it in 2018”. Advertising is part art, part science, and will be for the foreseeable future. To do it well, we have to understand the human condition in all its glorious, frustrating, amazing, stupid, brilliant and idiotic glory. We’re still wired to seek happiness, status, security, validation and love.